We are launching a public campaign to help us secure new premises, and we need YOUR help! When we started 10 years ago, we made our home at Hamilton House, which has become a beacon of Bristol’s community spirit thanks to the nurturing it has received from the management company Coexist. We are extremely grateful for the amazing support they have given us over the last ten years, which has been crucial to our success as a community organisation. Since we started in 2008, we have empowered well over 2,000 people from marginalised backgrounds to become independently mobile in the city through access to affordable and sustainable transport. We are now home to a diverse community of over 170 volunteers and Co-op members who are supported to develop lifelong bike mechanic skills, build friendships and have contact with positive role models. 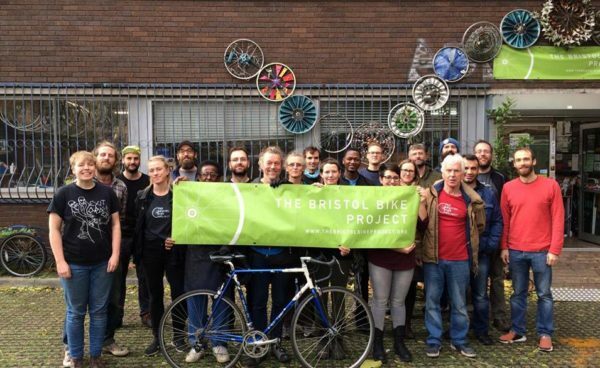 And we work with over 60 organisations across Bristol, including Bristol Refugee Rights, Bristol Drugs Project and Second Step, to support some of the city’s most marginalised communities. However, as many of you know, Coexist have been forced to leave Hamilton House at the end of the year. We have also been told we will need to find a new home some time in 2019. We are incredibly sad that we will no longer be a part of the Coexist family here at Hamilton House, but we have to see this change as an opportunity to grow the Project and boost our social impact. The Project has gone from strength to strength, and we are proud to operate a thriving community workshop and a busy bike shop. We are determined to keep serving our local community by providing bikes and mechanic skills to those who need them most, but we need all the help we can get to make sure we find the best place to do this! We are looking for suitable spaces anywhere in Bristol – we are flexible in our requirements, but need somewhere accessible, reasonably central and affordable. We are not sure yet when we will have to leave Hamilton House, but it could be as soon as February 2019 so we are looking for somewhere as soon as possible to ensure a smooth transition. Currently our shop and community workshop each occupy approx 750 sq ft (1500 sq ft in total), with approx 900 sq ft externally for bike storage. We are flexible and willing to be creative with space, for example seeking separate spaces fo the shop and community workshop) but wouldn’t want to constrain our social impact or ability to generate revenue with too small a space.